We are honored to announce that Abdullah Abdur-Rassaq has joined Project Unspeakable as an endorser. 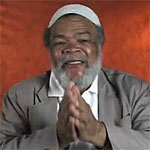 He is a former top aide to Malcolm X, charged with the formation of Malcolm’s Organization for Afro-American Unity. James Douglass interviewed Abdullah Abdur-Rassaq about Malcolm X while researching his book, JFK and the Unspeakables. He said Abdullah was one of Malcolm X’s closest aides in the year before Malcolm was murdered. He left the country for many years after the assassination, and now lives with his wife in Brooklyn. He is a speaker, writer, and Staff Consultant for Schomburg Center for Research in Black Culture.